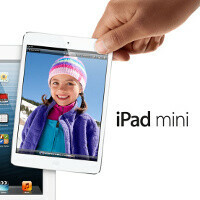 Apple to ship only 8 million iPad mini tablets in Q4 2012? The 7.9-inch iPad mini might not have seen the lines most recent Apple launches have been accompanied with, but nonetheless the affordable tablet sales are only slowed down by low supply, not demand. And now, it seems that earlier projections about the iPad mini selling in between 10 and 12 million units in the Holiday Q4 2012 will not come true because touch panel supply could not catch up. This - Taiwan supply sources whispered to Digitimes - will be the reason why Apple is expected to sell around 8 million iPad minis in the last quarter of the year. Next quarter, in Q1 2013, supply is finally expected to stabilize, and Apple could boost shipments to 13 million. 8 millions is not bad number and I guess that the most Apple could sell and not b-c of demand problems. Interesting how many Nexus 7 were sold in Q4. How do u know it wasnt ? Really, try buying a white mini, good luck with that one.